General sketch-map of a tidal plain, showing the typical tripartition in supratidal, intertidal and subtidal zones. The most apparent character of the area is the development of tidal channels, affecting mainly the intertidal zone. In this case, the tidal flat is protected seaward by a beach barrier, but in many cases (low-energy waves and longshore currents) the tidal flats may directly pass into a shallow marine environment. Tidal flats, along with intertidal salt marshes and mangrove forests, are important ecosystems. They usually support a large population of wildlife, and are a key habitat that allows tens of millions of migratory shorebirds to migrate from breeding sites in the northern hemisphere to non-breeding areas in the southern hemisphere. They are often of vital importance to migratory birds, as well as certain species of crabs, mollusks and fish. In the United Kingdom mudflats have been classified as a Biodiversity Action Plan priority habitat. The maintenance of mudflats is important in preventing coastal erosion. However, mudflats worldwide are under threat from predicted sea level rises, land claims for development, dredging due to shipping purposes, and chemical pollution. In some parts of the world, such as East and South-East Asia, mudflats have been reclaimed for aquaculture, agriculture, and industrial development. For example, around the Yellow Sea region of East Asia, more than 65% of mudflats present in the early 1950s had been destroyed by the late 2000s. Mudflat sediment deposits are focused into the intertidal zone which is composed of a barren zone and marshes. Within these areas are various ratios of sand and mud that make up the sedimentary layers. The associated growth of coastal sediment deposits can be attributed to rates of subsidence along with rates of deposition (example: silt transported via river) and changes in sea level. Barren zones extend from the lowest portion of the intertidal zone to the marsh areas. Beginning in close proximity to the tidal bars, sand dominated layers are prominent and become increasingly muddy throughout the tidal channels. Common bedding types include laminated sand, ripple bedding, and bay mud. Bioturbation also has a strong presence in barren zones. Marshes contain an abundance of herbaceous plants while the sediment layers consist of thin sand and mud layers. Mudcracks are a common as well as wavy bedding planes. Marshes are also the origins of coal/peat layers because of the abundant decaying plant life. Salt pans can be distinguished in that they contain thinly laminated layers of clayey silt. The main source of the silt comes from rivers. Dried up mud along with wind erosion forms silt dunes. When flooding, rain or tides come in, the dried sediment is then re-distributed. 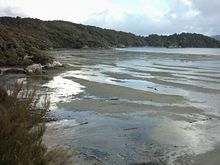 Wikimedia Commons has media related to Mudflats.